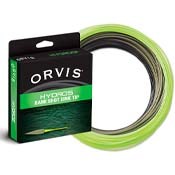 Orvis Hydros Bank Shot Sink Tip Fly Line ! This fast sink tip fly line quickly gets your fly into the feeding zone. 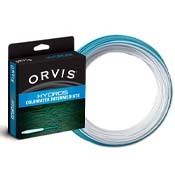 Orvis Hydros Coldwater Intermediate Fly Line ! This intermediate fly line eliminates stiffness in cold-water fishing conditions. 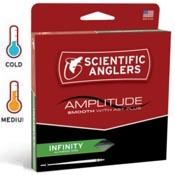 Scientific Anglers Amplitude Smooth Infinity ! The go-to line for all freshwater species. The conventional wisdom in fly fishing is that there’s no such thing as a “do it all” freshwater line. We have something to say about that. 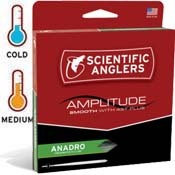 Scientific Anglers Amplitude Smooth Anadro/Nymph ! If you’re anything like us, the allure of big fish and big rivers is intoxicating. That’s precisely why we created the Amplitude Smooth Anadro/Nymph. 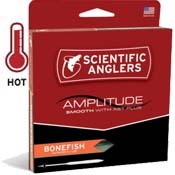 Scientific Anglers Amplitude Smooth Bonefish ! For Bonefish on the Flats. A day of bonefishing will either be the most fun you’ve had with a fly rod or the most frustrating day of your life. Take some of the chance out of the equation with the Amplitude Bonefish. 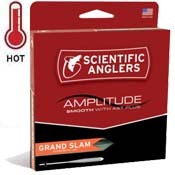 Scientific Anglers Amplitude Smooth Grand Slam ! Tarpon. Bonefish. Permit. All in one day. All on one fly line. That’s the idea behind the Amplitude Grand Slam, a line designed specifically to help you achieve one of angling’s most elusive accomplishments. With a short, powerful head the Grand Slam cuts through wind and turns over crabs, shrimp, and tarpon toads with ease. We’ve got the line. You just need the fish. Scientific Anglers Amplitude Smooth Titan Long ! The Titan Long combines the aggressive forward taper that we all know and love from our standard Titan Floating line for delivering poppers, big streamers, and heavy crayfish/hellgramite imitations with an elongated rear taper for more help when mending. Scientific Anglers Amplitude Smooth Trout ! 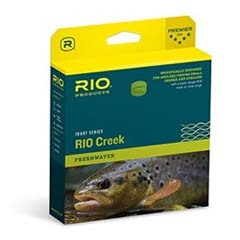 For Delicate Dry-Fly Deliveries to Trout. Featuring our unparalleled AST Plus slickness additive, the Amplitude Smooth Trout is designed specifically for precise presentations and those who love dry flies. 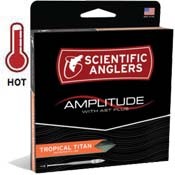 Scientific Anglers Amplitude Tropical Titan ! From tarpon and permit to snook and redfish, this line is built for the harshest environments, and biggest fish, out there. Designed with a camo tip, the Tropical Titan provides power, stealth, and durability. What more could you ask for? 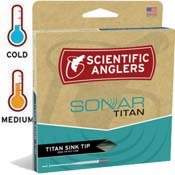 Scientific Anglers Sonar Titan Sink Tip ! So you know where the fish are holding. You’ve done your research. But you just don’t know how deep they are. Luckily, the SONAR Titan Sink Tip fly line offers a variety of solutions for all of your depth-finding needs. 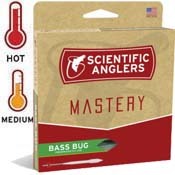 Scientific Anglers Mastery Bass Bug ! The term conehead doesn’t refer to an old comedy sketch. We totally get it. And that’s why we designed the Mastery Bass Bug. Similar in design to our Mastery Titan Long, but with a specialized warm-weather coating built to withstand hot temperatures. 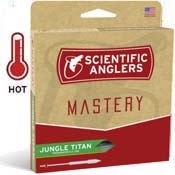 Scientific Anglers Mastery Jungle Titan Line ! When you’re knee-deep in a clear jungle stream somewhere in South America, you need the finest tools available in order to chase down the fish of your dreams. Whether it’s a radiant golden dorado or wickedly powerful peacock bass, the Mastery Jungle Titan fly line will get the job done. Built for the harsh jungle environments, and designed to turn over the largest flies possible, this fly line just might make you King or Queen of the jungle. 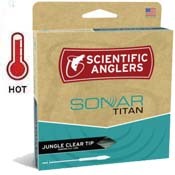 Scientific Anglers Sonar Titan Jungle Clear Tip ! The SONAR Titan Tropical Clear Tip fly line provides all the advantages of our Titan taper—easy loading and effortless turnover to name a few—and tops it off with an intermediate sinking clear head. 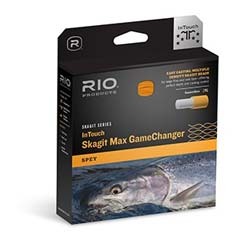 RIO InTouch Skagit Max GameChanger ! 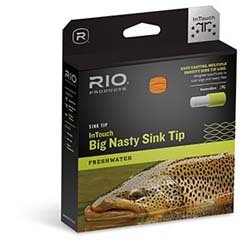 RIO InTouch Big Nasty Sink Tip Line ! 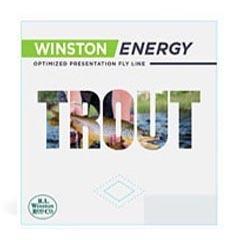 Winston Trout Energy Fly Line ! 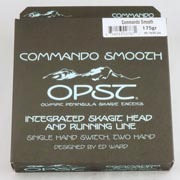 OPST Commando Smooth (Integrated) Line ! Commando Head and a thin, slick coated running line integrated into one with a smooth, gradual taper. OPST Pure Skagit Lazar Line - Green ! OPST Pure Skagit Lazar Line epitomizes everything people love about monofilament running lines: slickness, easy shooting, and thinness. Even better, it lacks memory, the main drawback common in mono. 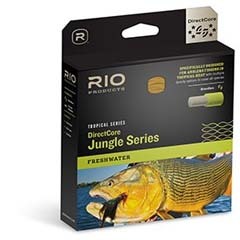 RIO’s JUNGLE SERIES of fly lines are designed to withstand the heat of tropical and jungle destinations. Paranix Multi-Polymer Fluorocarbon Tippet ! 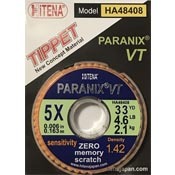 Paranix is completely new fly tippet material that has never existed in fishing before.